The room busted up in laughter. But then this hint of introspection sank in, maybe a second later, this knowingness among most of the 250 African-American college students who had lived with a black president for more than a third of their lives – after the land of the free and home of the brave had not elected one its first 232 years. They’re finally able to vote, but their candidate can’t run anymore. “It’s actually really weird knowing that someone else will be in office and knowing that right now I can’t vote for Obama,” Sam Hunt said. The “Barack Nostalgia Tour” made its first visit to North Carolina A&T in Greensboro at an intimate question-and-answer session Tuesday night in a curtained-off Alumni-Foundation Events Center. The Undefeated’s A Conversation With the President on Race, Sports and Achievement, moderated by Stan Verrett, produced humor, heart and, most of all, a harken back to 2008: hope. Hope among a generation of young black adults, who — like all of us — surprisingly woke up a few years ago in a country again full of black-white animus, a place where the term “post-racial” lasted maybe a minute. They have most every reason to feel as disenfranchised as their N.C. A&T brothers and sisters from the 1960s. And yet, moments after the president left the room, spirits soared. Longing for a man who they feel came to represent them first with his character and then his color. 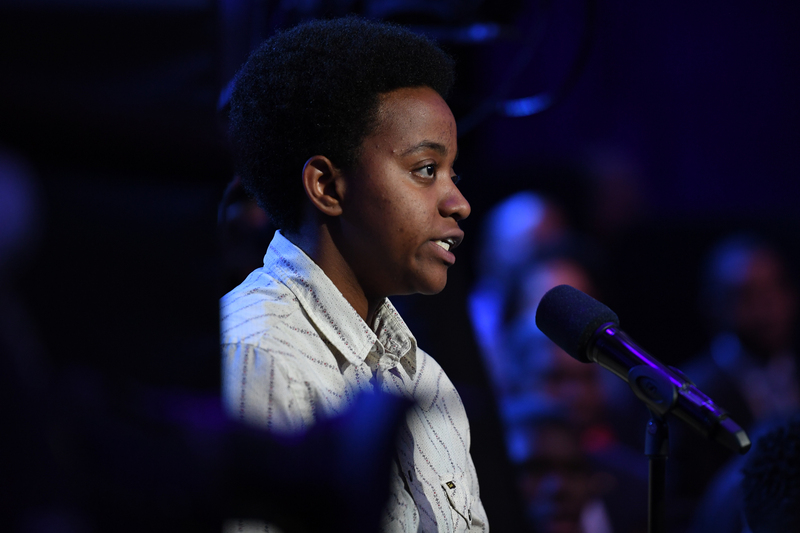 Nhawndie Smith, a senior political science student from Hampton, Virginia, spoke for much of the assembled, which included other HBCU students in the White House’s My Brother’s Keepers program and an assortment of media. Nearly eight years after the journey began, Obama came to the alma mater of the Greensboro Four, whose historic 1960 Woolworth’s lunch-counter sit-in ignited a grass-roots movement to push back against racial injustice throughout the South. Three months from leaving office, the first African-American president made his inaugural trip to the campus preserving the bullet holes from 1969 in red brick, next to a reflecting pool — the Greensboro Uprising, when students and National Guardsmen exchanged gunfire for four days because a segregated high school wouldn’t accept a popular young black man becoming student body president. Something felt so right, then, walking up to 21-year-old Jordan Greene, an accounting major and now N.C. A&T’s student body president. He will soon be a first-generation college graduate, breaking the ceiling for a family so proud of him. “I know things are not particularly great in many parts of society right now, but I can’t feel anything more than this uplifting feeling going forward after seeing the president sit a few feet from me and hearing him,” Greene said. “I went to the inauguration in 2008, standing back pretty far, where I watched on a TV. All I remember was it was so cold. I was like 13 years old. 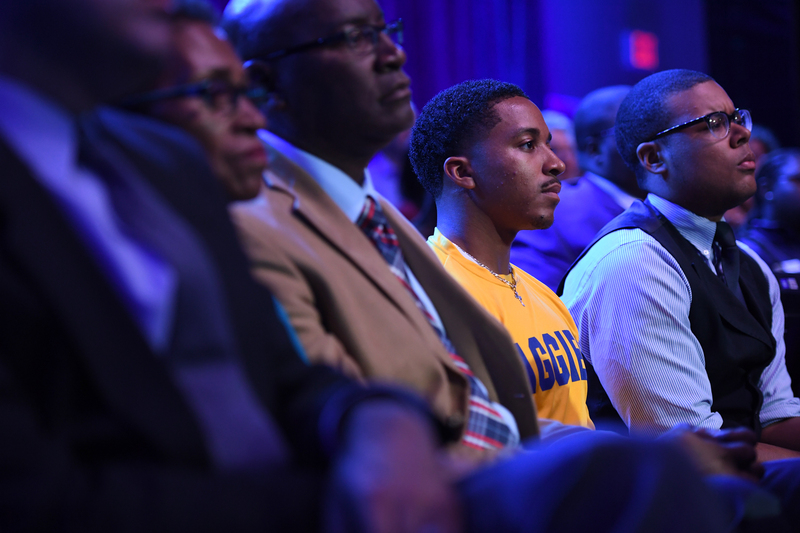 Nhawndie Smith asks a question to President Barack Obama during ESPN’s The Undefeated: A Conversation with The President: Sports, Race and Achievement at the Alumni-Foundation Event Center on the campus of North Carolina A&T on October 11, 2016 in Greensboro, N.C.
Naomi Nance, a senior majoring in journalism and mass communication, concentrating in public relations, got her ticket through the Office of Veteran & Disability Support Services on campus. She has lupus, but that hasn’t deterred her from an expected graduation date of Dec. 10. She, too, felt blessed. As they shuffled slowly out of the room about 20 minutes after the president and his detail left, there was this mixed feeling, blessed as much as bittersweet. Darren White, Sam Hunt, Naomi Nance, Jordan Greene, Nhawndie Smith, Jillian Nobles and the rest of their classmates and the crowd left the building a few moments later. Temperatures were falling outside, from mid-60s to the low 50s within an hour. But on a college campus in Greensboro Tuesday night, America didn’t feel cold. Justin Tinsley contributed to this article.